Also serving communities of Lithia Springs. There are 19 Assisted Living Facilities in the Austell area, with 3 in Austell and 16 nearby. The average cost of assisted living in Austell is $3,005 per month. This is lower than the national median of $3,346. Cheaper nearby regions include Powder Springs with an average starting cost of $2,750. To help you with your search, browse the 155 reviews below for assisted living facilities in Austell. On average, consumers rate assisted living in Austell 4.4 out of 5 stars. Better rated regions include Powder Springs with an average rating of 4.6 out of 5 stars. Caring.com has helped thousands of families find high-quality senior care. To speak with one of our Family Advisors about assisted living options and costs in Austell, call (855) 863-8283. Austell is a small city known as one of the top 10 suburbs near Atlanta to retire and one of the top 10 best places to retire in the state. With 44 assisted living facilities in the area, Austell offers plenty of options for seniors who need help with daily living. These facilities are known in Georgia as assisted living communities and personal care homes. Assisted living communities to provide care to 25 or more people while personal care homes provide personal service to two or more people. The Austell area is home to world-class medical facilities, including the WellStar Cobb Hospital and the Northside Hospital, in the event of medical emergencies or illness. Seniors in assisted living in Austell may find the city to be affordable due to the cost of living of 102. This is based on the national and state cost of living index of 100. Seniors and other individuals have a one in 31 chance of becoming a victim of any type of crime in Austell. The overall rate of crime is 21 percent higher than the national average, but most assisted living facilities have special security measures in place to keep their residents safe. Seniors who can't tolerate the cold may find Austell to be a comfortable place to live. Average July highs are around 88 degrees, while average winter lows are around 31. The city rarely gets any snow but gets around 53 inches of rain per year, which is higher than the national average of 39 inches. The Cobb Community Transit system offers the FLEX bus for seniors in Austell who need transportation to and from medical appointments, for errands and for outings. The bus offers curbside service that is available to all passengers with discount fairs for seniors. The state of Georgia does not tax Social Security retirement benefits, which may leave seniors in Austell with more money left over at the end of the year. The state also provides a deduction of $65,000 per person for all types of retirement income and does not have a state inheritance or estate tax. Assisted Living costs in Austell start around $3,005 per month on average, while the nationwide average cost of assisted living is $4,000 per month, according to the latest figures from Genworth’s Cost of Care Survey. It’s important to note that assisted living rates in Austell and the surrounding suburbs can vary widely based on factors such as location, the level of care needed, apartment size and the types of amenities offered at each community. 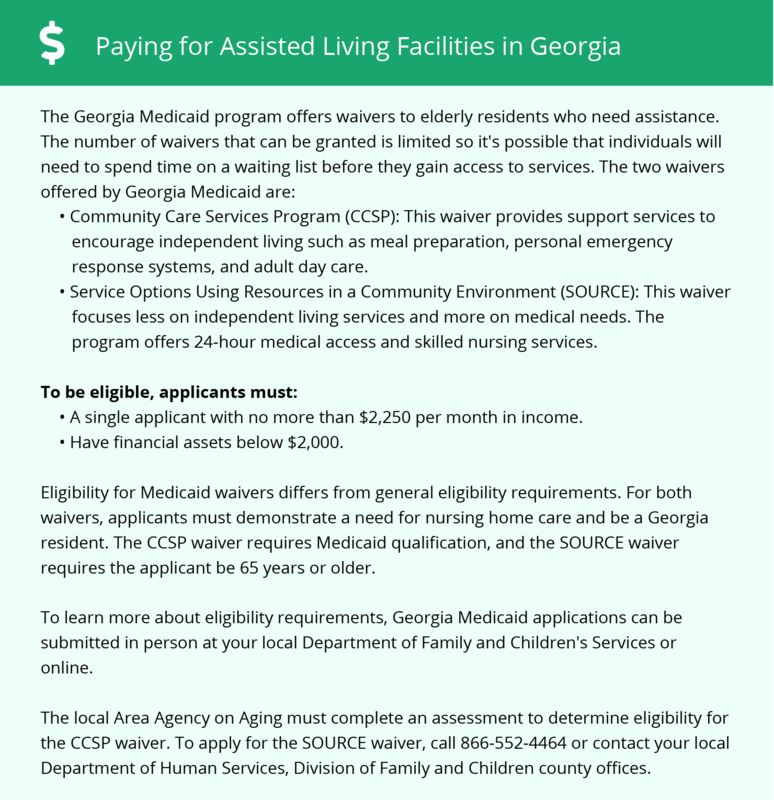 Austell and the state of Georgia have two Medicaid waiver programs that assist seniors that pay for services in personal care homes with at least 24 beds. This includes the Service Options Using Resources in a Community Environment (SOURCE) and the Community Care Services Program. To see a list of free assisted living resources in Austell, please visit our Assisted Living in Georgia page. Austell-area assisted living communities must adhere to the comprehensive set of state laws and regulations that all assisted living communities in Georgia are required to follow. Visit our Assisted Living in Georgia page for more information about these laws.